Clarissa and Jonathan Nagy have become quite the young power couple in Santa Maria, responsible for producing quality wines in the region at three different locations. Here's where to sample their wine, eat some great food and lay your head while visiting Santa Maria. I remember a time, though just barely now, when Napa Valley used to be the only name people would mention when talking about good California wine. I'm so happy that's no longer the case. Sure Napa is still producing quality wine, but the more popular they get, the more corporate the area feels. Big companies are buying up multiple properties so it's losing some of its smaller, family-run feeling. That's why my visit to Santa Maria was so refreshing because I got to sample wine at 3 different locations, with each being produced by half of the young and enthusiastic couple, Clarissa and Jonathan Nagy. Clarissa Nagy came to the wine industry through food, which may also be how I also came to love wine so much. Clarissa has a Bachelor of Science in Food Science from Cal Poly. After she did some sensory testing at some wineries, followed by production training at Edna Valley Vineyards, she was hooked and knew winemaking was for her. Clarissa spent the next decade working at notable names in the Central Coast like Firestone, Byron, Longoria and Rancho Arroyo Grande Winery. In 2005 when fruit became available from Garey Ranch, she went on to make her own Pinot Noir under the C. Nagy Wines name, and continues to do so to this day. The C. Nagy Wines tasting room is in the cute town of Orcutt (read on for a good sushi spot to enjoy a meal after wine tasting). Pieces of vine and barrels line the walls and after seeing this, you'll immediately start thinking about how you can recreate the cool look in your own house. You can taste Clarissa's soft, feminine touch in her Pinot Noir where the fruit shines, but is still balanced with some nice depth and a round finish. Her Pinot Blanc and Viognier are barrel fermented in neutral oak which gives them a beautiful richness. The Nagy Pinot Blanc is a real full bodied dream, that definitely lingers in the best possible way. Not content to just run her own wine label, Clarissa has also been the winemaker of Riverbench since 2012, which brings a new set of challenges and opportunities. Luckily one such opportunity has Clarissa producing a portfolio of sparkling wines at Riverbench. You don't see a lot of sparkling wine in this area, but the valley location and cloud cover that burns off fairly early makes it more than doable. It also means a selection of four different sparklers from brut rose, blanc and blancs (demi-sec), blanc de noirs and brut rose. Make sure you try a few to find your match. There's definitely more than one to please. Nearly 90% of the grapes at Riverbench are sold to neighboring wineries, as well as some locations in Sonoma. Chardonnay and Pinot Noir are king in this region and make up most of the Riverbench portfolio. I like that Nagy has a Chardonnay fermented in stainless steel to show off the purity of the grape. The Estate Chardonnay uses 30% French oak if you want a little more butter in your wine, but the acidity still keeps everything in balance. Clarissa's love of Pinot Noir shines here with fruit friendly wines that includes the Santa Maria characteristics of Chinese 5 spice and wilted rose petal. All of her wines paired nicely with our lunch from local favorite, Far Western Tavern. Is it just me or does everything taste better when sitting among the vines on a beautiful summer day? Not far from Riverbench is Jonathan Nagy, Clarissa's husband, at Byron Wines. Jonathan has been the wine producer at Byron since 2001. Ken Brown founded the Winery in 1984 and it went on to be owned by Mondavi, Legacy Estates and is now in the hands of Jackson Family Wines. Pinot Noir dominates Byron's line up. Jonathan works with a selections of vineyards in Santa Maria Valley as well as Santa Rita Hills to produce a range of Pinot Noir. The Pinots show off the diverse soil types from sandy soil to limestone, shale outcroppings and clay loam. Byron was one of the first in the region to use the gravity flow system. They also work with their own estate mill in France for their french oak barrels. Working directly with your own mill tends to produce a more reliable product that is treated exactly as you intended. Jonathan shared stories about how the product can be corrupt if you don't control the system like they are now doing. 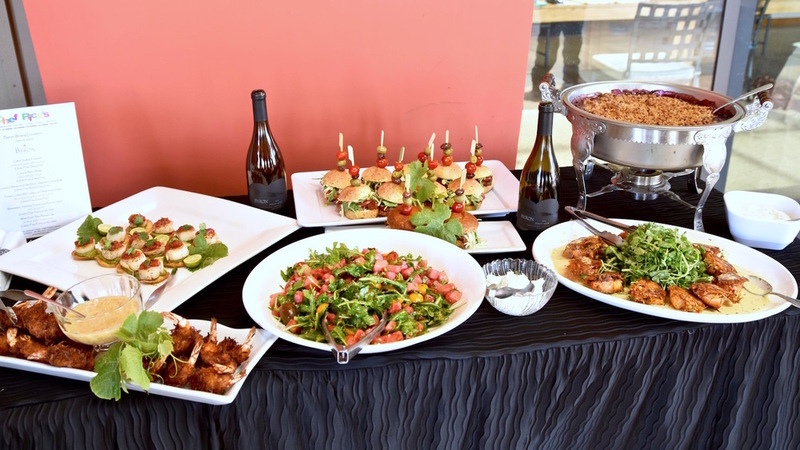 Chef Rick Manson whipped up a Santa Maria spiced menu that paired well with many of Byron's wines, and I was even happier for his mouth watering gluten free and dairy free menu options. The glass-enclosed Byron tasting room with beautiful views of the valley added to the delicious afternoon of food and wine. If you want a real taste of Santa Maria after a day of wine tasting, then you want to head to Shaw's Famous Steakhouse & Tavern. This meat-friendly restaurant is serving up Santa Maria barbecue. Come hungry, or with a friend, as the portions are extra large. Entrees come with pickled vegetables, a salad and a plate of food that is easily shareable between two or even three people. Classics include Santa Maria tri-tip, filet mignon, and baby back ribs. If you've had your meat fill, then check out sushi hot spot, Niya in Orcutt. We enjoyed a sake tasting, exploring the difference in varieties and the amount of rice polishing they do. The more the rice is milled, the higher quality, but you will pay for that as well. Niya offers creative rolls, large sashimi platters and seaweed salads to cover all the bases. If you're looking for some non-vineyard fun, but still want to sample local wines, check out Wine & Design. They set you up with all the equipment you need to paint your own masterpiece. The teacher is great in helping you to put your image together, including helping blend colors because you know after a glass or two, it's hard to remember what colors combine to make bright green! The Radisson is steps from the Santa Maria Public Airport and a short drive to Nagy Wines, both restaurants mentioned above and Wine & Design. The modern hotel has an atrium with two restaurants, an outdoor heated pool, free parking and complimentary internet. It's a great spot to base yourself for a visit to the Santa Maria region. I look forward to returning to Santa Maria soon and sampling more of what the region has to offer! Interested in More CA Wine Tasting? Check These Out. My trip to Santa Maria was hosted, but all opinions are always my own.